Spanish painter of Italian origin. His father was Italian and his mother Spanish. Her second husband, Pedro de las Cuevas, ran an excellent school of painting and drawing in Madrid, where Camilo trained along with many contemporary artists. Here Camilo would have been aware of the changes in painting that occurred c. 1630-40 as a result of the diffusion of prints by Peter Paul Rubens and the arrival at the court of paintings commissioned from Rubens by Philip IV. These made a deep impression on the Madrid school. With Francisco Rizi, Camilo was the earliest exponent of the High Baroque style in Madrid. He received his first commission from the Casa Profesa for a painting of St Francis of Xavier. He was on only twenty six when contributed to the decoration of Saln Grande de Comedias of the Royal Palace in Madrid by painting four pairs of royal portraits. He painted 14 fresco scenes for the Galeria de Alcazr in Madrid. In 1846 he painted figures for a still-life of Arellano. 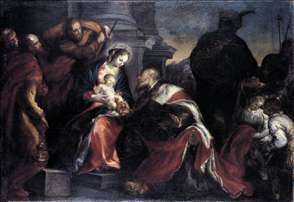 Camilo painted many religious paintings for churches in Madrid, Toledo and Segovia, none of which can be found in situ. In spite of the fact that some of his altarpieces are somewhat sentimental, he is one of the most significant artist of the Baroque school in Madrid.